Chromosphere comes from the idea to propose an artistic content and an original, innovative and brand new entertainment form. 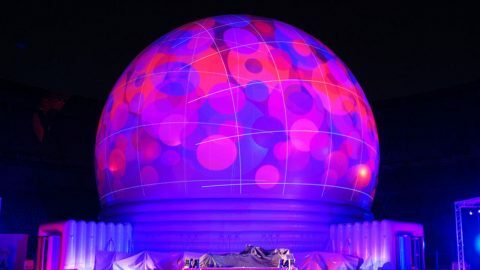 The focus of the event is an inflatable structure able to accommodate up to 200 people and to allow the public inside to enjoy the contents in a unusual, immersive and engaging way and at the same time capable of attract attention in the surrounding area, which becomes an outdoor stage loaded of artistic contents. Audience is welcomed by the video interactive installations located near the entrance and then comes in touch with different forms of expression, thanks to the amazing spherical projections on the massive structure, visible from neighboring to distant areas through to the great explosion of light and images. This approach allows to converge on the event an audience already acquainted with the contents proposed, both users traditionally far from art and culture. Chromosphere is conceived to be an itinerant festival focused on FullDome projections.